Our latest IXPA insights article uncovers the most frequently sought global interim management roles during the past 12 months. With 13 partners across 17 countries on 4 continents, IXPA is a leading alliance of interim management providers with local expertise and global reach. Each partner has a strong background of delivering a personal and well regarded interim management provider service in their given country. As IXPA grows, it will increasingly generate opportunities for partners to collaborate on international projects, sharing their skills and capabilities to support organisations worldwide. We asked our partners to share their thoughts and experiences of the interim management market in their region and reflect on the past year. Our 2017 Knowledge Report collates their views and provides a powerful insight into the current state of the global interim market. Which are the most frequently sought interim roles? We asked our interim management providers what roles they have provided experts for over the past year and we discovered that almost 90% of IXPA partners had fulfilled a role in transition management, making this the most frequently sought interim role. Growth and transformation was the second most popular role, followed by turnaround and restructuring. Although many IXPA partners are still working largely on roles within their own country, some of our partners told us that they had worked on projects with an international remit and in certain cases this had involved working with other IXPA partners. More than 75% of interim assignments run for between 6 and 12 months. 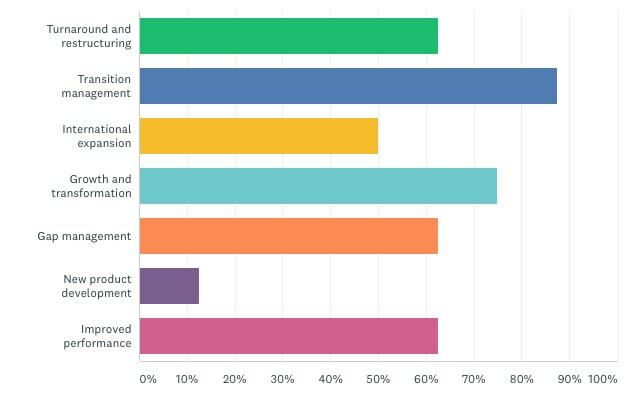 Which industries are most likely to seek interim support? The manufacturing sector is by far the largest source of interim work for IXPA partners around the globe. Each one of our partners has provided experts to manufacturing companies in the past year. The professional services sector is the second largest source of interim work for IXPA’s global partners, followed by technology. Logistics, construction and retail are also key sectors for interims. Brexit does not appear to be a concern for IXPA’s global partners. They either don’t expect it to have an impact or they believe it will create more interim opportunities. Most IXPA partners expect interim pay rates to remain static over the next 2 years. What are the key issues affecting the the interim market around the world? Digitalisation is starting to have an impact in some parts of Europe, challenging the traditional Interim Management provider business model on price. However, this is being counterbalanced by growth driven by an increasing awareness of interim management throughout Europe and beyond. This, coupled with the fact that filling gaps for permanent positions is becoming more and more difficult for companies, while the economy is growing, is bolstering the interim market. It isn’t all plain sailing in Europe and in some countries there is a lack of confidence in transition management and a certain degree of confusion about how to introduce an interim strategy and use interim managers to fill a resourcing gap. In the UK, tighter regulation of freelance workers and a maturing interim market are key influences, and the gap between management consultancies and interim management providers is narrowing. Increasingly, companies are looking for a provider that can satisfy both initial advisory and delivery capabilities. In the USA, deeply seasoned veterans are in demand but more than half the time the price gap between that of an Interim Manager compared to a permanent member of staff gap is too big. Meanwhile, in China there is still a lack of understanding of interim services from both the client and candidate perspective.